Maximum reward is $150 per visit. One warranty reward per 60 day period. After submission a new password will be emailed to you. If you need further assistance contact your manager. MBToyotaRewards.com provides valuable rewards you can spend with Moss Bros Toyota which accumulate as you maintain your vehicle. You earn rewards for every dollar you spend with us that can be redeemed for service or repairs. MBToyotaRewards.com rewards registered users for service and repairs performed on their vehicle at Moss Bros Toyota. This site tracks and allows a registered user access to view rewards as they accumulate and are used. 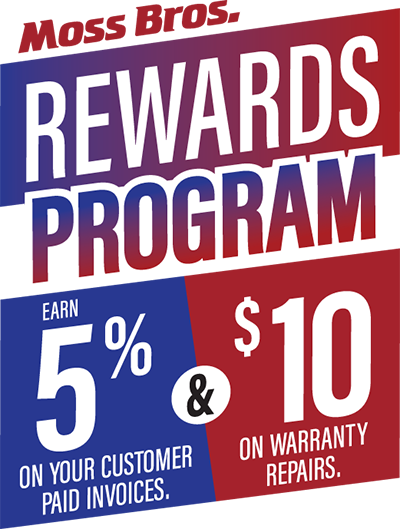 Rewards can be redeemed for future service and repairs at Moss Bros Toyota. Does MBToyotaRewards.com cost me anything? No. We do not ask you for any credit card or payment information. How do I sign up for MBToyotaRewards.com? You can sign up for MBToyotaRewards.com by clicking the New Users Click Here! button on the home page. We ask for your name, e-mail address, and zip code. When you sign up, you'll receive access to MBToyotaRewards.com's exclusive features, such as your personalized garage page and an up-to-date statement of the awards you've accumulated and redeemed. To create your personalized garage page, we'll need your Vehicle Identification Number (VIN) and a valid email address to use as your logon. Can I use the site if I don't have this information handy? No, you must register to start earning rewards. If you prefer, your dealer may register for you on your next service visit. Where can I get my VIN? While visiting Moss Bros Toyota, ask the Service Advisor or Cashier to print you a redemtion certificate for the value you select, up to the total awards accumulated for your account. It's just that easy! MBToyotaRewards.com provides the information and services on its World Wide Web site(s) (the "Site") under the following terms and conditions. By accessing and/or using the Site, you indicate your acceptance of these terms and conditions. MBToyotaRewards.com grants you a non-exclusive, non-transferable, limited right to access, use and display the Site and the materials thereon for your personal use only. The information available on or through this Site is the property of MBToyotaRewards.com, or its licensors, and is protected by copyright, trademark, and other intellectual property laws. Users may not modify, copy, distribute, transmit, display, publish, sell, license, create derivative works or otherwise use any information available on or through this Site for commercial or public purposes. Users may not use the trademarks, logos and service marks ("Marks") for any purpose including, but not limited to use as "hot links" or metatags in other pages or sites on the World Wide Web without the written permission of MBToyotaRewards.com or such third party that may own the Mark. MBToyotaRewards.com reserves the right, at its sole discretion, to change, modify, add or remove any portion of these terms and conditions of use, in whole or in part, at any time. Changes in these terms and conditions of use will be effective when posted. You agree to review these terms and conditions of use periodically to be aware of any changes. Your continued use of the Site after any changes to these terms and conditions of use are posted will be considered acceptance of those changes. User agrees not to modify, move, add to, delete or otherwise tamper with the information contained in MBToyotaRewards.com Web site. User also agrees not to decompile, reverse engineer, disassemble or unlawfully use or reduce any of the software, copyrighted or trademarked material, trade secrets, or other proprietary information contained in the Site. Although MBToyotaRewards.com monitors the information on the Site, some of the information is supplied by independent third parties. While MBToyotaRewards.com makes every effort to insure the accuracy of all information on the Site, MBToyotaRewards.com makes no warranty as to the accuracy of any such information. This Site may contain links that will let you access other Web sites that are not under the control of MBToyotaRewards.com. The links are only provided as a convenience and ADP does not endorse any of these sites. MBToyotaRewards.com assumes no responsibility or liability for any material that may accessed on other Web sites reached through this Site, nor does MBToyotaRewards.com make any representation regarding the quality of any product or service contained at any such site. MBToyotaRewards.com prohibits unauthorized links to the Site and the framing of any information contained on the site or any portion of the Site. MBToyotaRewards.com reserves the right to disable any unauthorized links or frames. MBToyotaRewards.com has no responsibility or liability for any material on other Web sites that may contain links to this Site. MBToyotaRewards.com shall have the right for any reason, in its sole discretion, to terminate, change, suspend or discontinue any aspect of the Site, including but not limited to content, features, or hours of availability. MBToyotaRewards.com may also impose limits on certain features and services or restrict your access to parts or all of the Site without notice or liability. You shall indemnify, defend and hold harmless MBToyotaRewards.com, and all its officers, directors, owners, agents, employees, Content providers, affiliates, licensors and licensees (collectively, the "Indemnified Parties") from and against any and all losses, damages, liabilities, and claims and all fees, costs, expenses, of any kind related thereto (including, without limitation, reasonable attorneys' fees) incurred by the Indemnified Parties in connection with any claim arising out of, based upon or resulting from your use of the Site. MBToyotaRewards.com reserves the right, at its own expense, to assume the exclusive defense and control of any matter otherwise subject to indemnification by you and you shall not in any event settle any matter without the written consent of MBToyotaRewards.com. Information and documents provided on this Site are provided "as is" without warranty of any kind, either express or implied, including without limitation warranties of merchantability, fitness for a particular purpose, and non-infringement. MBToyotaRewards.com uses reasonable efforts to include accurate and up-to-date information on this Site; it does not, however, make any warranties or representations as to its accuracy or completeness. MBToyotaRewards.com periodically adds, changes, improves, or updates the information and documents on this Site without notice. MBToyotaRewards.com or any of its third party service providers assume no liability or responsibility for any errors or omissions in the content of this Site. Your use of this Site is at your own risk. UNDER NO CIRCUMSTANCES SHALL MBToyotaRewards.com OR ANY OF ITS THIRD PARTY SERVICE PROVIDERS BE LIABLE FOR ANY DAMAGES TO USER, INCLUDING ANY INCIDENTAL, SPECIAL OR CONSEQUENTIAL DAMAGES THAT RESULT FROM ACCESS TO OR USE OF THIS SITE, EVEN IF MBToyotaRewards.com WAS ADVISED OF THE POSSIBILITY OF SUCH DAMAGES. Protecting the privacy of our clients and users of our Sites is important to MBToyotaRewards.com. The MBToyotaRewards.com Internet Privacy Statement describes how we use and protect information you provide to us on our Site. User acknowledges and agrees that by providing MBToyotaRewards.com with any personal information through the Site, user consents to the transmission of such personal user information over international borders as necessary for processing in accordance with MBToyotaRewards.com's standard business practices. Access to and use of password protected and/or secure areas of the Site is restricted to authorized users only. Unauthorized access to such areas is prohibited and may lead to criminal prosecution. These terms and conditions shall be governed and construed in accordance with the laws of the State of Arizona, USA, and applicable federal laws without regard to conflicts of law principals. User agrees that any and all proceedings relating to this site and the subject matter contained herein shall be maintained in the courts of the state of Arizona or the federal district courts sitting in Arizona, which courts shall have exclusive jurisdiction for such purpose. What is your VIN? It's your Vehicle's Identification Number. Metal plate on the front windshield on the driver's side. Copy of invoice from a previous service. White sticker inside the driver's door. Service Rewards can be applied toward service and repairs at Moss Bros Toyota. Sales Rewards can be applied toward the purchase of a new or pre-owned vehicle at Moss Bros Toyota. This feature allows you to recapture rewards from a customer's past service visit and/or purchase date. The grace time for a customer to register and earn rewards after a service visit is 14 days. The grace time for a customer to register and earn rewards for buying a vehicle is 365 days. This function allow you to reset the customers registration date. Resetting the registration date will calculate rewards from the date you select. Example: a Customer requests rewards from a previous service visit on 10/22/2018. Reset the registration date to 10/22/2018. Moss Bros Toyota reserves the right to amend or discontinue this program at any time and with no notice.